It is interesting to have a closer look at Renaud Jerez’s original path as a painter, as his material work toward sculpture has progressively developed, through the lens of digital communication via assimilation, stratification and deformation. There is nevertheless a very physical and material dimension that remains in his work, uncovering the so-called technological power of a very real technical armada made of cables, screens and keyboards, but also cans of Coke and sandwich wrappers. Thus his mummies-sculptures were born, these shell beings, these dry machines whose substance has evaporated, as a kind of metaphor “for a desire for destruction and dehydration of monetary, computer, liquid and living systems,” as the artist states. 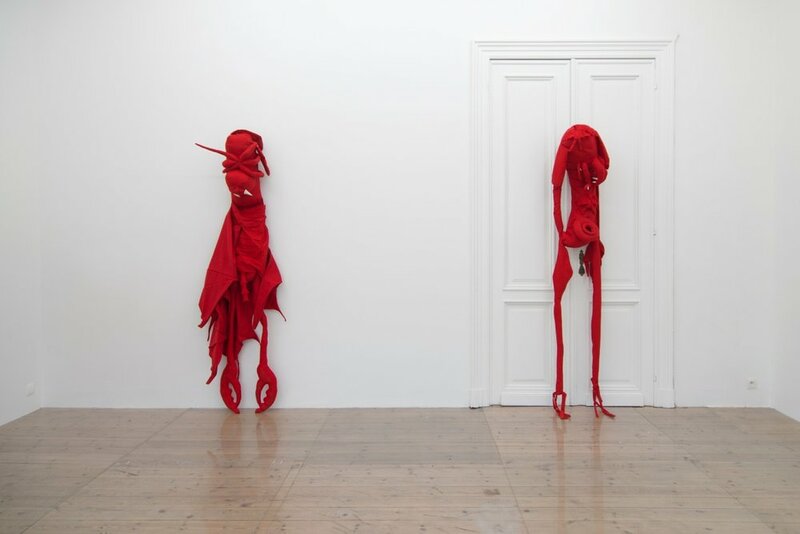 For this exhibition at Catherine Bastide Gallery, Renaud Jerez moves from this state of lyophilization, from the inert, from a being disconnected and emptied from its substance to that of the living, the organic, the liquid, the blood from a languid material. 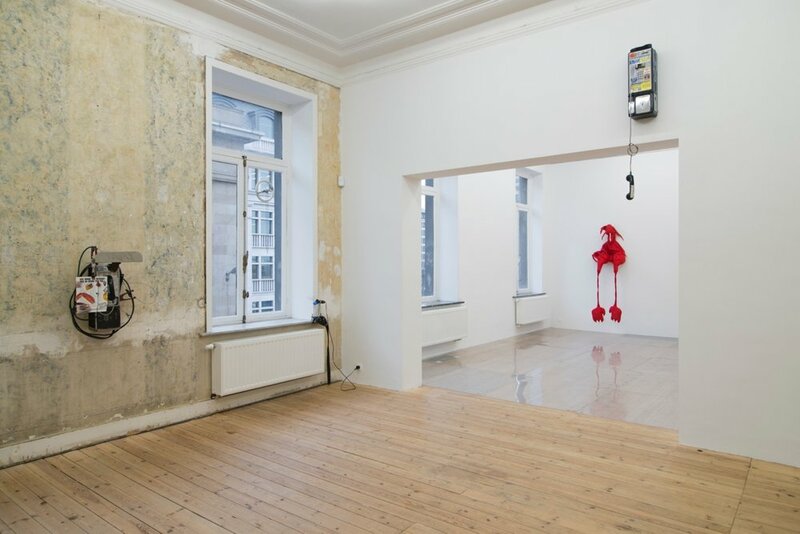 Five human-sized vampire-like red stuffed figures looking almost skinned are hung on the gallery walls, drip-ping their volume, sometimes intertwined with metallic screen frames as if they were shifting from a virtual existence to an organic structure. Or maybe they try to cling to an artificial bone structure, a sort of exoskeleton, a solid prosthetic that responds to their fluid, puppet-like state. Here, vampirisation tenderly happens; infection softly propagates itself; the monster, the parasite is funny and sweet and recalls a certain type of soft sculpture from the avant-gardes of the 1970s. It would be almost possible to see this as a kind of Pop shamanism where the voodoo artist lets us consume his own demons in a tactile manner. A gentle “Theater of Cruelty” where “the action…as with the Plague, is salutary” (Antonin Artaud). The artist escapes the temptation of “smartness” and amuses himself with the dichotomy inherent to his practice, where porosity and permeability constitute its essence. Some Plexiglas plates from the Paris subway are arranged on the floor, entirely covering the space. Visitors are thus encouraged to tread to the rhythm of their own steps on these ghostly cartographic screens, where traces of a subterranean urban world can be faintly made out. Jason Matthew Lee is interested in the history and theory of pre-internet communication, through a person-al approach, revealing their myths and paradoxes. He presents a series of Payphones, telephonic machines harking back to pre-internet hacking. The first payphones worked in such a way that after a coin was inserted, a sound was emitted at a specific frequency corresponding to a precise duration corresponding to the coin’s monetary value. Red Boxing, a very simple scam, consisted in conning the phone company thanks to a small machine, the “red box” that had been conceived to emit tonalities almost identical to the long-distance call ones. In the era of cyber encryption, these first attempts to divert communication tools with the help of a very simple sound object belong to the mythology of cyber crime. Beyond this story, these analog objects have the charm of an obsolete technology, recalling Cyberpunk and even Steampunk cultures, the sort of post-apocalyptic or retro-futurist devices that contain urban melancholy and symbolize the functioning of our neo-liberal societies. We can still read, 1. Stop 2. Listen for tone 3. De-posit coin. By extrapolating, we can suppose that these Payphone objects participate in the Actor Network Theory, a so-ciological approach developed from the 1980s on and taking into account not only humans but also (non-hu-man) objects and discourses, interacting with each others as actants, mediators or intermediaries. Jason Matthew Lee’s telephonic machines are ready-mades that have been sabotaged twice. A first time by the vicissitudes of urban life with scratches, wear and tear, and a second time with a truly sculptural work by the artist, from the machines being eviscerated to their cabling and uncabling, to the breaking of the handsets but also to the hybrid compositions where prosthetic limbs, cell phones and neon lights come and contaminate the object. Spray paint recalling the kitsch, mythological themes of street art graffiti sometimes also sets the tone for the “Icarus Complaint” machine. A true poetical mechanics, as with this other Payphone titled “Flowers of Evil”, these objects are urban totems containing the complexity and subjectivity of all forms of communication. With degrees in philosophy and literature, Rosa Aiello tackles CG animation and video editing as a type emo-tional associative language that challenges the viewer’s relation to space and to the body. In her animations, embodiment 3 occurs in the absence of human forms, objects shift from a dormant, la-tent state to a carnal and sensual mode, fraught with possibility and suspense. Camera movements suggest a subjectivity that exists behind the frame, an off-screen presence who perceives and guides the viewer’s expe-rience. As part of her project for the gallery, Aiello presents a recent video, “A River in It.” which takes this relationship of control to it’s literal conclusion. “A River In It” is inspired, in part, by one of conceptual art’s emblematic pieces, “Swamp,” 1971, by Nancy Holt and Robert Smithson; as well as by the novels of Samuel Beckett. The film opens in darkness, followed by the repetitive rhythm of breathing, footsteps, and a synthesized guitar note giving the beat. 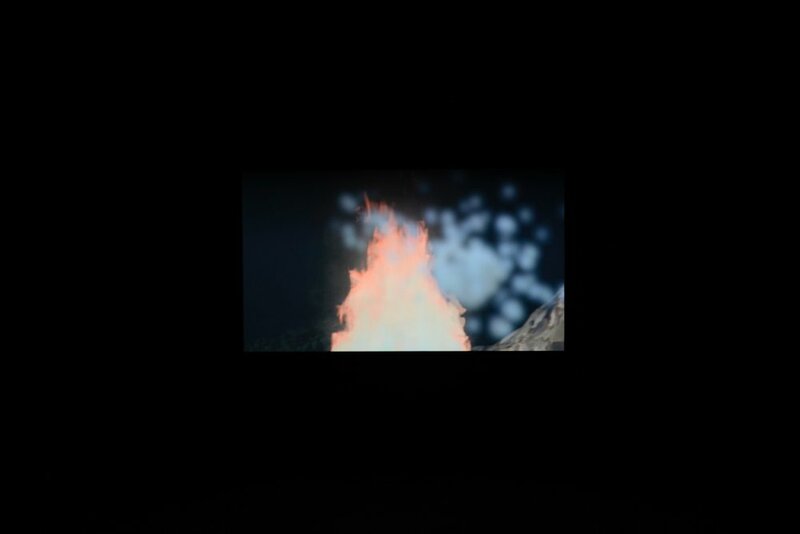 A female voice (artist Olga Pedan’s) instructs the viewer or camera-person to “Just walk in a straight line.” From obscurity to flickering incandescence the image is absorbed, and the cycle starts again: “Directly in front of you, into the clearing… Go ahead, walk forward… Proceed straight ahead...go on, go on,” The camera’s final immolation occurs in the clarity of the light of the fire, and yet embryonic shapes are barely visible. In Aiello’s piece, narrative itself occurs invisibly. As with the haunting rhythm of the soundscape, which evokes obstacles including tumbling rocks, mud, exhaustion, a river, and an angry mob the voice composes space and defines visual form. Blinded both by darkness and by the glow of the fire – the fire being both the only light source and that which reveals the power of the dark environment – the gaze must follow the voice, sometimes comforting, sometimes contemptuous, sometimes oppressive. Whether or not we trust this voice, she invites us to enter a state outside of choice, where we may experiment with a process of sensing though the opacity of language, sound, and space. Virtuality, material wizardry, pagan vitality or urban sensibility, before everything else, Embodiment presents a generation of artists reinventing itself and its own culture. 1 According to one of the artists, Renaud Jerez. 2In Kaleidoscope Magazine, issue 18.